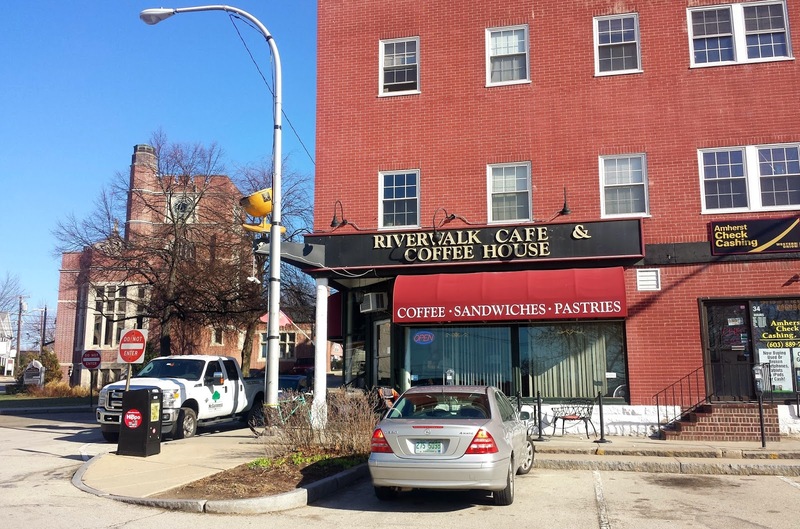 Next up on my spring travel coffee list is Riverwalk Coffee Roasters in Nashua, NH. My extended weekend primarily brought me to Concord, NH for a conference, but I flew into Boston, took a train to NYC and another train to NJ before flying back to Florida. On my travel from NH to Boston South Station, I hunted down coffee places along the route. The website looked intriguing and reviews seemed positive. I was particularly intrigued that they roast their own coffee in house. Organic and Fair Trade is a nice bonus too. The inside has a coffee cafe feel, but not the snooty hipster crowd that frequents Starbucks or other cafes. Most of the people inside seemed like working class New Englanders, definitely regulars as there was a "Cheers: NORM!" feel to the place. I drank a cup of coffee there and had a muffin. The coffee was fantastic! I don't remember much about the muffin. It was good, but then again baked good anywhere but Florida are good. They have several roasts available. Peru La Florida brewing when I arrived. It also caught my eye because a good friend of my wife and I is from Peru, plus we live in Florida. Perfect! I would later learn that getting only one bag was a poor decision. Once I brought it home and experimented with the beans/water ratio I discovered how good this coffee was. I should have bought WAY more than one bag! The beans look rather unimpressive and resemble house coffee of moderate to poor flavor, but that it so far from reality. All of their coffee was in brown paper bags like this. It looks like each one was hand stamped. Coffee types were written in black sharpie by someone with much better handwriting than me. The back was plain with no stories or other information. I enjoyed it so much that I barely had enough beans left for a photo. It has a solid coffee flavor and aftertaste, but is comforting. It is a wonderfully smooth yet complex coffee. It's the kind of coffee that you just want to keep drinking all day. This is by far one of the best coffees I've review thus far and is just barely shy of that 5/5 rating. Yes, I would go as far to say that it is wicked awesome! If you're anywhere near the Nashua, NH area or can reasonably drive there, do it, just make sure you buy some for me!